This is a pre-launch advert for MARVEL UK's BLAKE'S SEVEN: A MARVEL MONTHLY (aka Blake's Seven Magazine), launched in 1981 to coincide with the fourth (and final) season of the TV series. 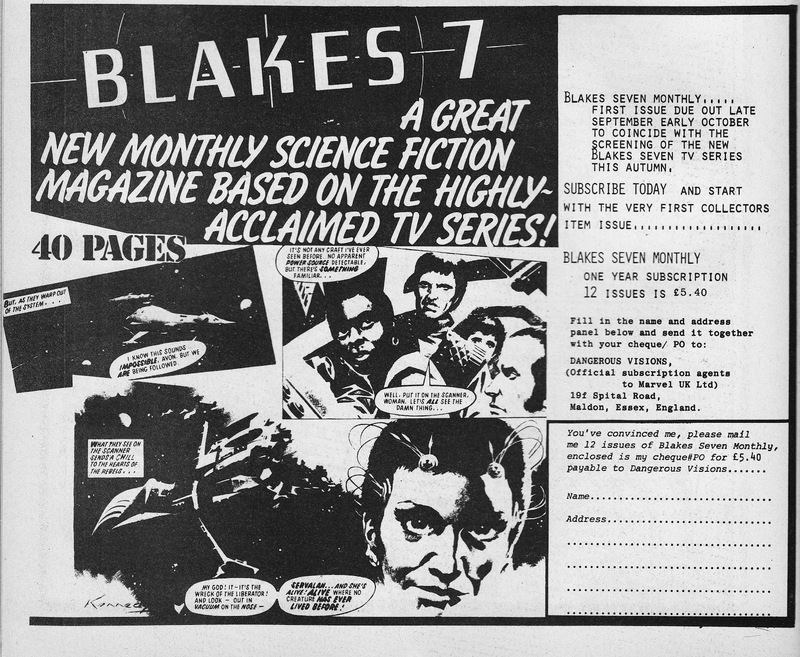 The artwork, which never appeared in the magazine, is from the sample strip Ian Kennedy created to help pitch the magazine. The page of colour art was produced before the fourth season format was locked by Marvel and features Servelan floating around in space in the wreckage of the Liberator. If only the series had been that creative. Kennedy's art was produced in colour and some of the early coverage of the magazine suggested that it was (somewhat improbably) going to be a full-colour-throughout affair. It wasn't and fans were forced to wade through page after page of murky black & white stills snapped during the filming of the final year. Those pictures would be, in retrospect, a treasure trove of behind the scenes snaps (apparently only a fraction of the colour stills were actually used, for covers and centre-spread posters) but - so the story goes - they were all destroyed (in a fire?) years later.